Overture Arboretum is a 60+ age-restricted apartment community in Austin, Texas that offers residents maintenance-free homes, resort-style amenities, and plenty of lifestyle options. 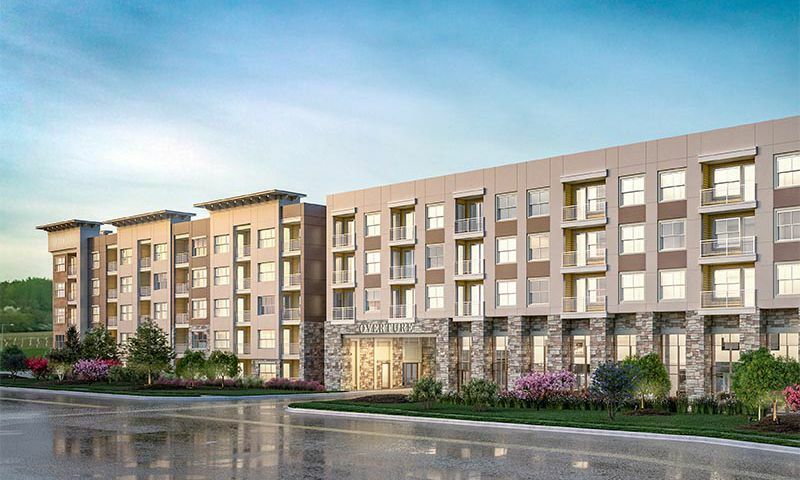 The community's location also ensures that residents have easy access to the world-class dining, shopping, entertainment, and recreational options throughout Austin. Active adults looking for apartments for rent in an age-restricted community in Austin, TX should take a look at the benefits of Overture Arboretum. Just because residents of Overture Arboretum are renting doesn't mean that they can't have access to resort-style amenities. In fact, the community boasts 12,000 square feet of amenity space to enjoy. A main feature of Overture Arboretum is the selection of dining opportunities. Hungry residents can grab a bite to eat in the bistro cafe and enjoy a sit-down meal in the large dining area/meeting room or private dining room. There’s also a demonstration kitchen for when they want to learn how to make meals of their own. Before or after the meal, residents can socialize and mingle with neighbors in the game room or theatre. A hair salon on the premises puts one of life's necessary conveniences right next door. For residents who want to exercise, a fitness center and yoga studio offer regular classes and an opportunity to stay physically active. Many residents enjoy swimming and relaxing in the outdoor swimming pool. Pet owners appreciate the community's dog park. Overture Arboretum features 184 apartment homes that range between 619 and 1,342 square feet. These one-bedroom and two-bedroom residences feature wood-style plank flooring, large windows, designer lighting, and individually controlled heating and air conditioning. Kitchens come complete with granite countertops, wood cabinetry, dishwashers, stainless steel appliances, and French-door refrigerators. Each bedroom features plush carpeting and walk-in closets while bathrooms feature walk-in tiled showers, garden tubs, granite countertops, medicine cabinets, and linen closets. Each unit also comes with a full-size top load washer and dryer. Residents of Overture Arboretum have no shortage of activities to take part in as well as opportunities to create lasting experiences with friends and neighbors. Active adult fitness-lovers will enjoy the many classes available, including Zumba, Tai Chi, and water aerobics. There’s also Wii fitness training. Foodies can take cooking classes together and then take part in one of the many potluck dinners that pop up. Residents can also participate in movie nights, game nights, and holiday parties that are planned throughout the year. Crafting events and book club are also available. The community even organizes off-site sporting events and day trips so friends and neighbors can travel together. Along with fun activities, there are also a variety of ways for residents to maintain their mental health and continue the never-ending learning process. Safety seminars, wellness education classes, and nutritional guidance are all offered regularly. Residents also have access to computer and software classes, history courses, ancestry research, and writing classes in order to continue their education. Overture Arboretum is located in Austin, Texas close to U.S. Highway 183 and Loop 1, which gives it an ideal location to enjoy the many dining, shopping, and entertainment options nearby. It’s also easy to use public transit to get where you need to be and the community partners with Lyft to help residents get around town. Plus, the Austin location means residents can easily drive to San Antonio or Houston. The community is located within walking distance of Arboretum at Great Hills, which offers easy access to shopping and dining opportunities such as Trader Joe’s, HEB, Arboretum Market, Talbots, and Ann Taylor. It also includes a multitude of restaurant options, including SLAB BBQ Grill, la Madeleine Country French Café, Manuel's, The Cheesecake Factory, and Z'Tejas Mexican Restaurant & Grill. The Domain, which includes over 100 retail stores, is just three miles away. When residents need health care, the community is just minutes from some of the top hospitals and health facilities in Austin. Those looking to get out in nature can explore the waterfalls at Balcones District Park or take a stroll through Bull Creek Greenbelt Park, both of which are nearby. Golfers will be able to hit the links at Great Hills Country Club as well. There are plenty of activities available in Overture Arboretum. Here is a sample of some of the clubs, activities and classes offered here. Overture Arboretum consists of 184 apartment homes that range between 619 and 1,342 square feet. The one-bedroom and two-bedroom residences feature wood-style plank flooring, large windows, designer lighting, and individually controlled heating and air conditioning. Want to learn more about Overture Arboretum?